You want straighter teeth, but you don’t want to cover them up with metal braces — and we don’t want you to, either. Traditional metal braces are just too time-consuming and visible for most busy adults. Fortunately, there is a better way: Invisalign in Independence offers you sweet freedom from that most conventional orthodontic option. Keep reading to learn more from the team at Independence Family Dentistry! We call them clear braces, but Invisalign actually consists of invisible plastic aligners that fit securely over your teeth. So they are clear, and they are braces — but probably not the kind you’re thinking of. Let’s take a closer look at how Invisalign works. To create your unique Invisalign treatment system, Dr. Nakhla will take a series of x-rays, impressions and photos of your mouth. This information is sent off to the Invisalign lab, where your trays are created and then sent directly to you. You can begin your treatment immediately, wearing each tray for about two weeks before advancing to the next in the series. This approach allows you more freedom and flexibility, with far less time spent shuffling back and forth between your dentist’s office. And after just about a year, on average, your treatment is complete and you’re smiling straighter and more beautifully than ever before! Invisalign allows you to straighten your teeth privately, without everyone knowing you’re undergoing orthodontic treatment. In fact, chances are excellent no one will ever notice you’re wearing Invisalign throughout your treatment. 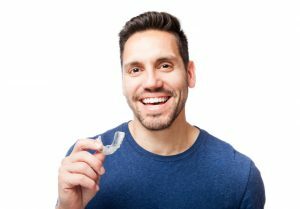 The Invisalign trays are removable, allowing you to brush, floss and eat without abiding by any special rules or techniques. Wear your trays the recommended 20 to 22 hours each day and you’ve got total eating and cleaning freedom. With fewer dental appointments and a shorter treatment time overall, with Invisalign you spend far less time dealing with your braces and more time enjoying your new, beautiful smile! Are we leaving anything off this list of benefits? If you’ve started or completed the Invisalign treatment through Independence Family Dentistry, we’d love to hear from you — let us know about your experience in the comments below! When you’re ready to experience the difference that clear braces can make for your smile, don’t hesitate to contact Independence Family Dentistry. We’re here to help you enjoy your healthiest, most beautiful smile — and we offer a number of other smile treatment options to that end, too.